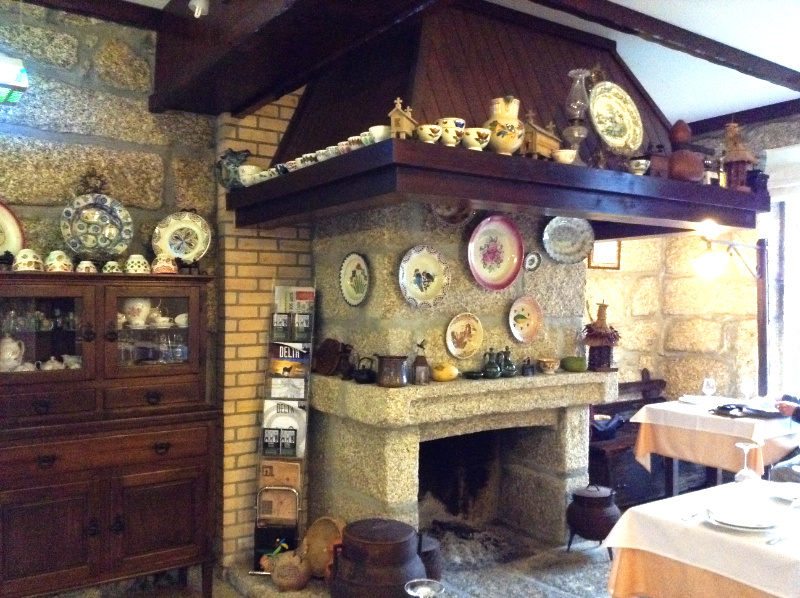 A chat by the fireside in the Saber ao Borralho restaurant: food for thought as well as the stomach. What do you do when the weather is wretched and you need cheering up? 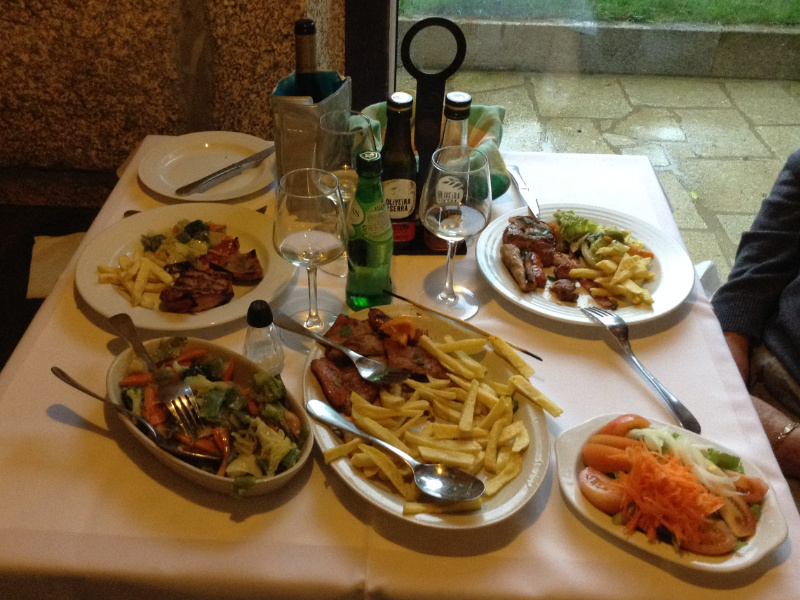 During the last deluge in the Minho we decided that the thing to do was to pop down into Soajo for a meal. Two different people had recommended the.... Now this where we ran into difficulty. I thought I had heard the name 'Sabor do Borralho' – that would be the Taste of Borralho, though I had no idea what kind of food borralho might be. My husband, however, jokingly said it had something to do with barulho which would seem rather a bizarre choice of name for a restaurant as it means noise. You want peace and quiet over a good dinner rather than noise, don't you? It was a puzzle. To find out what the name of the restaurant actually was and why it had been recommended, click here. We drove down to Soajo in torrential rain, with the wind howling around us and twigs and small branches littering the road. It was the sort of evening when anyone who goes out to dinner of their own volition must need their head examining! We made a dash from the car park into the restaurant and took the host, Sr. Manuel, by surprise. He was drooping by the bar, prepared, I think, for an evening of 'no shows'. He tucked us into a corner by the fireplace. Doesn't it look attractive with its pots and plates? Just imagine it in the depths of winter when there's a roaring fire! 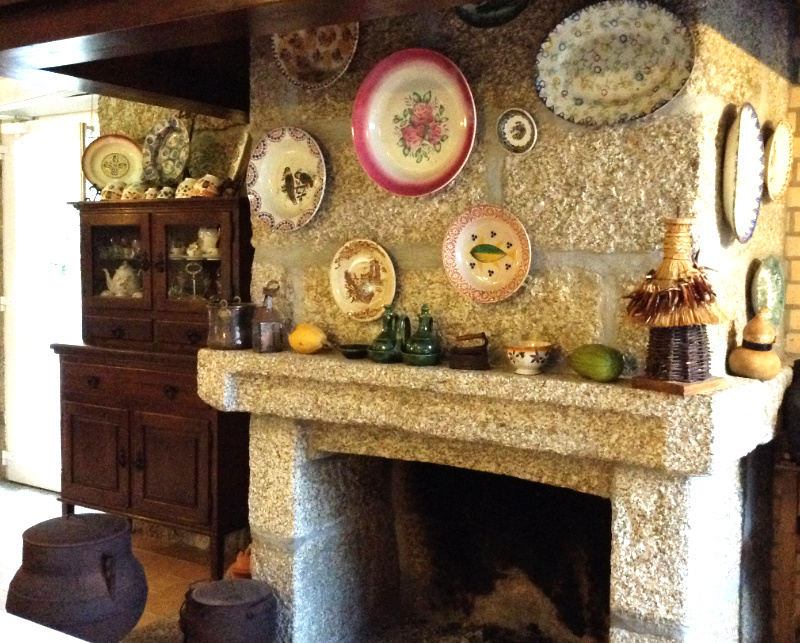 As there was no one else to require his attention, he found time to explain that the stone hearth that I know as a lareira is called a borralho in the Minho. Are you now thinking that I was probably more or less right in my assessment of the name? The Taste of the Fire Place is a pretty odd name but when you look at those big iron cauldrons on legs – the ones we always used to call the 'missionary' – and imagine the hearty stews made in them, it sort of makes sense. Well I'm afraid you'd be as mistaken in that judgement as I had been in mine – though in some ways I was not completely on the wrong tack. The actual name is Saber ao Borralho and there is a play on words here. Saber can be used for to taste; for example, a sopa sabe bem means the soup tastes good. But saber also means to know: eu sei means I know. So what exactly does this name mean? According to Sr Manuel, in days gone by people in poor parts of the country, who lived in houses without electricity and who had never learned to read and write, would gather round the hearth to make use of the firelight and share the news, the village gossip and whatever else they might have learned. So the name of the restaurant is something like 'The Fireside Chat' with overtones of good food being cooked there too. Interestingly Sr Manuel also spoke of Casamentos ao Borralho. I assumed from what Sr. Manuel had said before about poor households that this must be some form of unofficial, rustic marriage ceremony carried out when people couldn't afford the priest's fee. Well, having started out on the wrong tack, I seemed doomed to continue on it. In fact, to mix metaphors, I was barking up the wrong tree yet again. Hearth weddings were those where the better-off families - principally the male members - got together round the fire to discuss who should marry whom in order to keep the wealth together. Young women, of course, being little more than chattels at the time, don't seem to have had any say in this. It was clearly just tough luck if you didn't like the young man whose lands together with yours made a nice big farm! What, you may ask, are tremoços? The internet tells me they are called lupin beans – are you any the wiser now? Nor me! I've never seen them in Britain but they fascinate me. I find them terribly moreish. It's not so much the taste, which is in fact rather dull, as the squeezing of the outer skin that lets the inner bean pop suddenly into your mouth that I find addictive. It's a bit like the snap of good chocolate – you just want it again. So now that I've failed to use my common sense and eaten titbits, thus filling myself up and getting sticky fingers, let's get back to the menu. 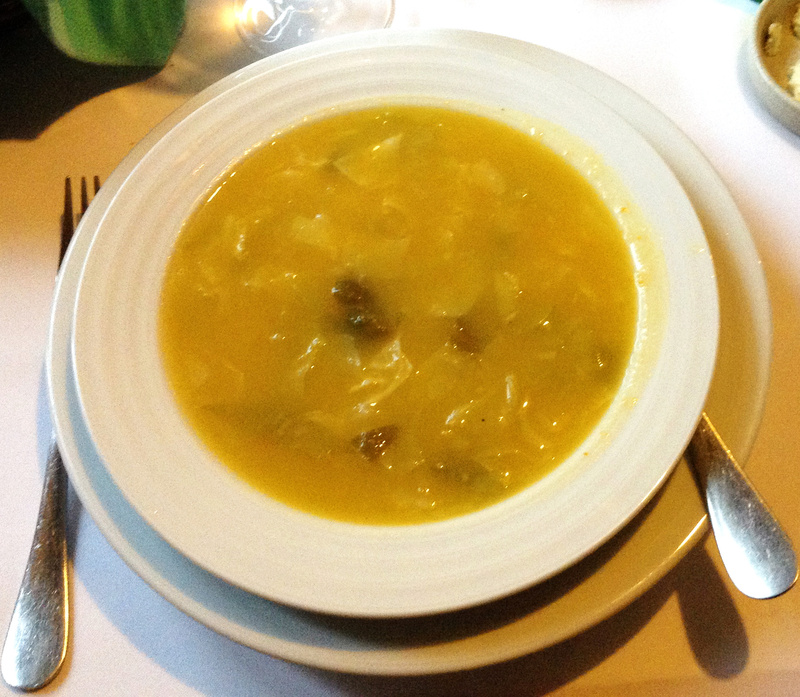 I also find it hard to resist thick, tasty, Portuguese vegetable soups. So that's what we started with. This, by the way, though the soup was delicious, was another bad move as the main course we chose, a dose of mixed grill with chips, rice, salad and boiled vegetables, had been cooked with a farm labourer in mind. Since we hadn't been toiling in the fields with a mattock from dawn to dusk, this dose – usually considered enough for two people – would easily have served four. 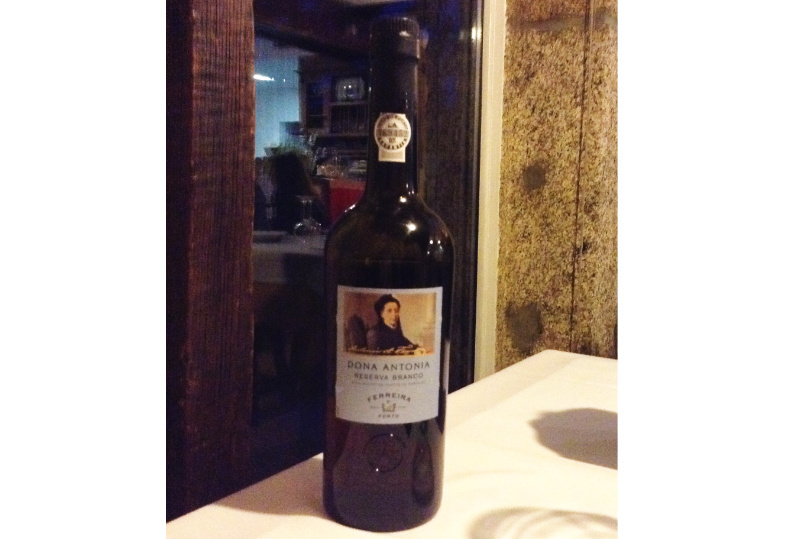 We were also offered a night cap of port wine on the house. We enjoyed our meal and, more pleasing still, discovered that this restaurant, established with help from the European Union, had enabled Sr Manuel to remain in the village. If it hadn't been for the financial help, he would have had to move to a town or perhaps even emigrate. As it is, he is providing a venue for village celebrations and a way of keeping tourist euros in the countryside. 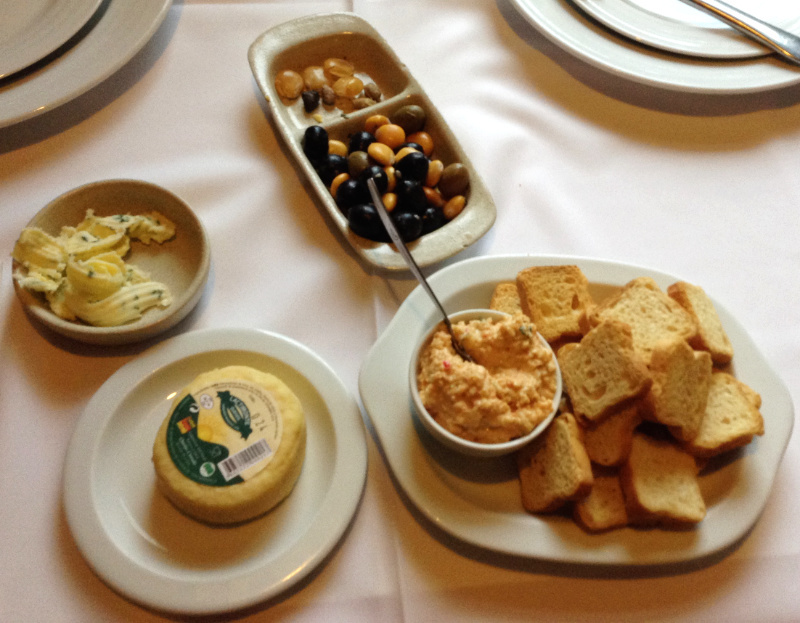 So, if you're staying up in the posh hotel at Mezio and you want a more typical, less expensive, meal than you can get there, you could do a lot worse than drive down to the Saber ao Borralho and have a chat and a meal with Sr Manuel.